Q: What is aerial advertising? A: Aerial advertising is about your company's message being towed behind an airplane. The location could be a crowded highway at rush hour, a crowded beach at spring break, a rock concert or sporting event. The idea is your message is seen and remembered by thousands of potential customers. Q: Why use an aerial platform? A: Even if your message is strictly personal, chances are you will find airplane advertising more affordable than you imagined. Take a few minutes to familiarize yourself with this eye catching, high impact method of getting your message out there. Whether you are advertising to the entire world, or just to your bride to be, aerial advertising is a great way to say just about anything. Q: Will people see my aerial message? A: We fly at 1000 feet when over land. Remember the last outdoor venue that you attended? You successfully tuned out all the other commercials and product placements you were bombarded with during the event - except the aerial advertisement you saw. Whether flown coast to coast, regional, or local, your aerial message will be seen and remembered. Q: How long will people see my message? A: The average view time for an aerial ad is 17 seconds. This may not seem very long, but they are getting the message about your product or service while being entertained by the airplane. Q: Will people remember my ad? A: In surveys, 88% remembered seeing an aerial advertisement go by after 30 minutes. 79% of respondents remembered the product or service being advertised. 67% were able to recall at least half the message. Q: Where do you fly? A: Over crowded beaches, rush hour traffic, ballparks, race tracks, festivals, rock concerts, theme parks, parades, etc. Q: Can I fly my campaign in multiple regions? A: We can ship your custom aerial billboard from market to market all around the country. We will manage your local, regional and national aerial advertising campaigns. Q: What types of aerial billboards can I get produced? A: We can produce both custom painted and computer generated aerial billboards that incorporate your company logo and custom artwork. Q: How big will my billboard be? A: We can produce and fly any size up to 30' high x 100' long. Q: What are the artwork requirements? A: Just get us your artwork on a CD at 150 dpi. The scale for the letters should be 1"= 1'. Set up your artwork in Photoshop or Illustrator. Q: How much lead time do I need to have a custom aerial billboard created? A: We require 5 days to produce the custom painted billboard and 10 days for the production of the computer generated billboard. Q: What is a letter banner? A: A letter banner is a banner that holds letters and/or characters. These banners are generally used to spell out a personal message. You can personalize a letter banner any way you wish. Examples of what we fly are: proposals, birthdays, announcements, advertisements, complaints, etc. Our banners are 7' tall and are either red or black lettering. Q: How much lead time do I need for a simple letter banner message flight? A: We need only 1 day advance notice to produce a letter banner. Q: Do you provide contract? A: Yes. Conditions for the performance and payment are clear. Q: Are any permits needed? Q: Are there any flight restrictions? 1) Within 15 miles of downtown Washington, D.C.
3) Any sporting event with stadium seating for 30,000 attending (from 1-hour before to 1-hour after the game). Q: What kinds of companies use your services? A: Here are a few product lines that have successfully used aerial advertising campaigns: Websites, soft drinks, beer companies, liquors, suntan lotions, clothing lines, record labels, Broadway shows, real estate offices, radio stations, newspapers, movie studios, television networks, airlines, banks and other financial institutions. Q: What does AZSKYAD know about me or my customers? A: Your future consumers are bombarded with more advertising messages than ever before, and they have become increasingly savvy to tuning out such messages. From clever product placement in movies, to television, radio, newspaper and internet, there is such an overload of marketing messages that it is increasingly difficult for your business to break through the clutter. Surveys of recent advertising campaigns have revealed that advertising using airplane banners are responsible for almost 20% of responses to a typical ad campaign. That's more than the impact generated by television commercials for the same campaigns. Your airplane campaign can reach hundreds of thousands of prospective customers at a cost of pennies per thousand viewed. Your potential customers are more likely to channel surf than to watch television commercials that you spent thousands of dollars producing. Likewise, highway commuters will “Frequency Hop” rather than listen to your radio message – you do the same thing! Printed ads are for people already shopping for a specific item and unless you are thinking about the “Penny Saver” and a postage size ad, we are less expensive, considerably more effective and tremendously underestimated by you. Q: What does AZSKYAD know about brand awareness? A: Building brand awareness is the best way to set your business apart from its competitors. To build your campaign effectively, it is vital to know not only what the customer wants but the best way to present your brand image to the consumers. Flying billboards are eye-catching attention getters that the customer will remember long after they have tuned out all the other advertising they saw and heard that day. AZSKYAD will enhance your strategy by literally putting you above your competition. We can make you the official or unofficial sponsor of any event. No other form of advertising will offer this envied status to you. Meanwhile, the competition is spending thousands to participate with the rest while you spend hundreds – unchallenged from above. Q: Will I/we bear any liability for a mishap to include noise complaints? A: No. AZSKYAD is fully insured and safety conscious with an accident free record. Our pilots are highly qualified with “Mishap Free” aviation careers. We have never experienced a noise complaint and do not anticipate one. We seek out a ready audience and advertise to them in a fun and non intrusive manner. Our presence is always welcome whether in the form of a break from the monotony of grid-lock commuting or entertainment while sunbathing. 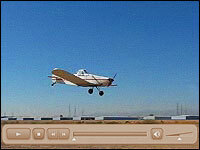 Click the picture above for a video demonstration of how the aerial advertising is done. © 2008 - 2019 AZ Sky Ad all rights reserved.